Bitless Headstalls - MRE has created a selection of bitless bridles, focusing on those that are kind to the horse. As we have participated in distance riding sports and love trail riding in general, we have found it especially kind to the horse to let them go bitless whenever possible. It`s made eating and drinking on the trail easier - as well as kinder to the mouth for long rides. The Freedom Bridle is a unique product, quite different from the Bitless Bridle and the many variations available on the market for years. The Freedom Bridle is a rider configurable headstall, designed specifically for the needs of the distance rider. For those who spend a great deal of time on the trail, you know that as the environment changes, your horse’s response changes and you may need more or less input to his behavior. (Headstall shown is in Saddle Brown Beta with Black Beta overlay and rein, brass hardware.) Please scroll down past product options to see additional functionalities and customization information for this bridle! 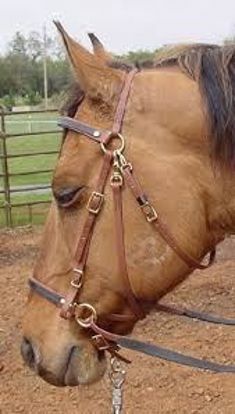 The Evolution Bridle is a unique, multi-purpose product, quite different from the Bitless Bridle and the many variations available on the market. Use it bitless with the included special rein, as a sidepull, with a bit, and as a halter. Like our Freedom Bridle, it is a rider configurable headstall, designed specifically for the needs of the distance and trail rider. Please scroll down past product options to see additional functionalities and customization information for this bridle! Have a horse who rides out nicely in a halter, but you`d prefer a more refined looking headstall? Have a young horse you are just starting out, and needs to learn his/her turns? Have a horse that is fussy with a bit but minds well? Our sidepull works awesome for all of the above! Scroll down for more information! Our Hackamore Bridle has been uniquely designed to angle strapping and hardware away from the eyes. Please note hackamore not included. Scroll down for further information!